High speed measurement reading response, Universal Serial Bus (USB) interface computer connection pressure sensing devices. UPS-HSR USB Pressure Sensor with High Sample Rate Logging- USB ready digital pressure sensor for recording pressures with a high speed sample rate of up to 1 kHz to a computer. 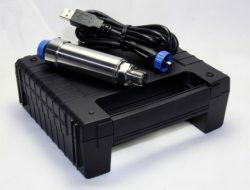 The UPS-HSR is supplied with a 2m long USB cable, PC software and case. Choose a pressure range from 2.5 bar up to 5000 bar with a G1/4 or 1/4 NPT male up to 1500 bar, and AE F-250-C female up to 5000 bar. In test and research applications where one of the key measurement parameters is rapidly changing, it is necessary to use instrumentation that can collect readings at a very high speed. For example if the hydraulic pressure in an actuator arm is increasing and decreasing at a frequency of 5 Hz, the pressure measurement device will need to measure in the order of x100 Hz to provide enough readings to characterise how the position is changing during one full cycle of movement. The speed of response is typically limited by the sensing technology or the signal conditioning electronics, regardless of how fast either one is, the slowest one will always dictate the overall measurement response. For example a very quick microprocessor combined with a slow reacting pressure sensor, will provide lots of data points from the pressure sensor. If the pressure changes faster than the response of the pressure sensor then many of the data points will lag behind the actual pressures at the time they were recorded or transmitted. The Universal Serial Bus (USB) interface is a popular digital interface for quick and easy connection of measurement devices to desktop & laptop computers and other digital measurement instrumentation. A USB connection provides a global standard for the physical electrical connection, communication and powering of digital sensors and measurement instruments. A single cable is used for sending all the read & write commands, and providing a low dc supply voltage. USB is a popular method for connecting measurement devices together in a research laboratory environment on experimental test rigs, where all test equipment is close by on the same test bench or rig. The majority of USB measurement devices come with application software which can be installed on a laptop or desktop computer. USB provides the user with a plug & play set-up that can be up and running very quickly without the need for wiring, separate power supplies or signal conditioning instrumentation. 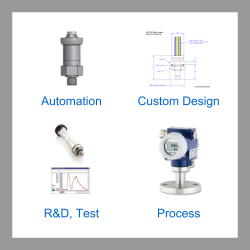 Pressure sensors are measurement devices for detecting variations in pressure of liquids or gases. Typically a pressure sensor is made of two subcomponents, an electromechanical assembly on the frontend, and a signal conditioning module on the backend. The frontend of the pressure sensor is connected directly via a thread or clamped seal to a pipe or vessel containing the liquid or gas to be measured. The pressure generated by the liquid or gas will apply a force to a sensitive exposed surface area within the electromechanical assembly which produces a physical change to the material, such as a deformation. This physical change is translated into an electrical change by smaller elements incorporated into the sensitive part of the assembly, typically on the reverse side of the surface in contact with the liquid or gas. Since there are many different types of electromechanical technology used to measure pressure, producing very different electrical characteristics, it is necessary to add on a signal conditioning module to rationalise the electrical signal and convert it to one which is a commonly used standard within a particular industry or application. Send us your enquiry for High Speed USB Pressure Sensors to get assistance with this product type.